It’s finally here. After waiting close to a year for this the world has been gifted with the greatest app/website ever. SimpsonsWorld.com allows those with cable provider log ins to watch any episode of The Simpsons ever made on demand. You can pick and choose from the over 550 episodes at will. Just knowing that there is so much to enjoy brings a joyful tear to my eye. This new site creates not just a haven for Simpsons mega fans like myself, but for those that wish to have a binge watch that could easily sustain a few months. Even at the absolute fastest possible watching speed someone would need close to twelve full days to make it through the series from beginning to end. I have finished television shows within work weeks before. The Simpsons is the ultimate challenge for my friends that like to plow through television shows. 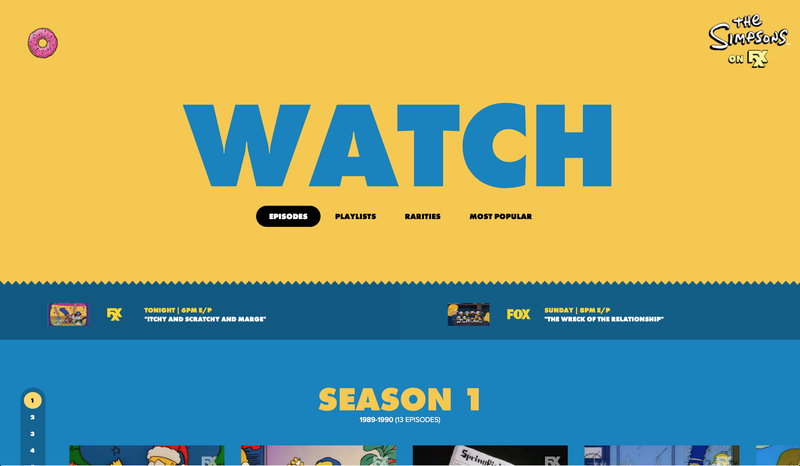 This website was designed for me – a Simpsons obsessive – and people like my brother Chase who can watch shows for absurdly long amounts of time. Better yet is a feature that Netflix should steal immediately: Random. By clicking this button the viewer will be treated to a randomly selected Simpsons episode. While there is incredible joy in being able to pick from an entire library, there is not much more fun than sitting back and letting chance provide you with terrific moments. Just today I watched close to five random episodes in a row spanning three different decades. It was awesome. There are also curated playlists that stick on certain reoccurring themes in the show that can be watched now. This is a cool feature not just in actuality but in potential. The choices that exist just hours (the website went live yesterday, 10/21) after after launch are great and presumably there are more interesting parings to come. I have seen every episode ever made. I have seen almost all of them multiple times. I have seen seasons 2-10 at least thirteen times over in totality. My challenge to the world – read: my friends who have not done the same – is to take this glorious invention and run with it. Enjoy the most amazing television program ever created. This is the future of television – an entire online universe for beloved shows. This is groundbreaking and hilarious. These are great times we live in. Go forth and binge watch.